Elsewhere in Europe, the storm set dangerously low temperatures: Lithuanian officials said temperatures that plunged to as low as minus 24 degrees Celsius (minus 11 Fahrenheit) in some places were to blame for the deaths of at least three people over the weekend. Hospitals in Lithuania and Latvia have reported an uptick in people being treated for hypothermia and frostbite. 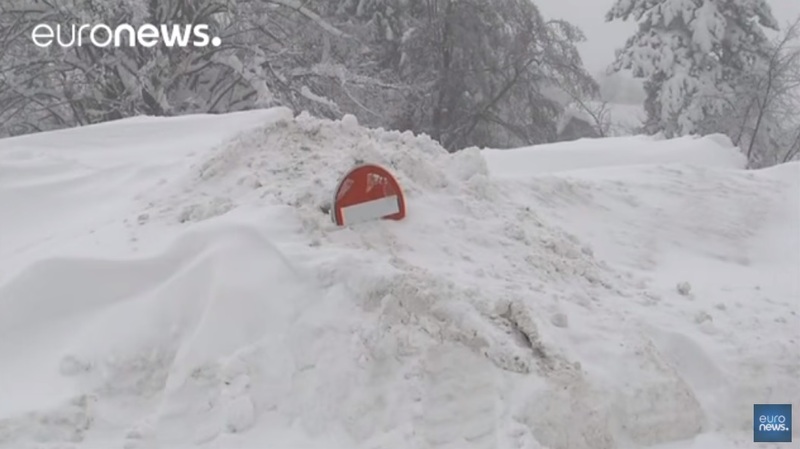 Swedish Prime Minister Stefan Lofven's car skidded off the road in a snowstorm north of Stockholm and smashed into a railing, one of several snow-related traffic accidents in Sweden. Meteorologists in Germany, meanwhile, reported a record low for this winter of -27 C (-16.6 F) on the Zugspitze mountain in the Alps. Moscow, as well, recorded its coldest night this winter, with the mercury dipping to nearly -20 C (-4 F) on Sunday night. Doctors in Britain warned that the already-stretched National Health Service may have trouble coping with extra patients affected by what meteorologists are forecasting will be days of cold and high winds. British Airways canceled a number of short-haul flights into and out of Heathrow Airport. Britain is bracing itself for heavy snow after the Met Office issued amber weather warnings - indicating a possible risk to life - for large swathes of the country. The alert has been raised for snow showers on Tuesday morning, covering the South East, northeastern England and the East Midlands. Forecasters predict up to 15cm (6in) of snow could fall in just a few hours with the warnings in place between 2am and 12pm. An amber warning is also in place for the northeast of England and Scotland between 6am on Wednesday and 12pm on Thursday, with up to 40cm (16in) of snow expected to fall during that period. There could be blizzards, gales and sleet on Thursday as Storm Emma hits the cold air already over the UK. The wind chill, which could see parts of the country drop as low as -15C (23F), is on par with forecasts for parts of northern Norway and Iceland. The Met Office said rural communities could be cut off, with power outages and disruption to mobile phone services likely. More than 200 Greater Anglia trains are no longer running on Monday and Tuesday, while South Eastern passengers were told to finish journeys by 6pm on Monday to avoid disruption. Public Health England has urged people to check on elderly or vulnerable neighbours during the cold spell. Members of the public have also been asked to look out for the homeless and report anyone sleeping rough in the freezing conditions to their local council. 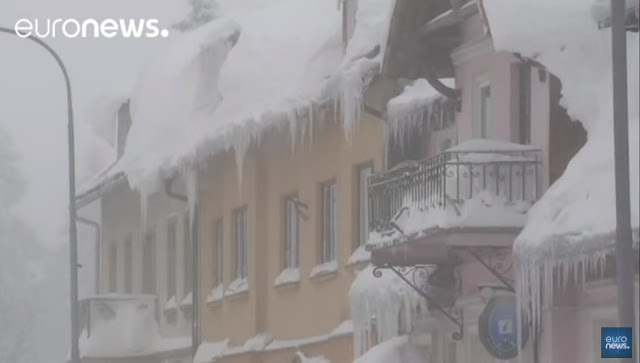 Sky News weather forecaster Chris England said the snowfalls are set to become more severe this week. He said: "Snow showers will continue over many eastern areas tonight, turning heavy in places, with some getting across to northwest England later. "Parts of eastern England in particular can expect around 15cm (6in) of snow, leading to some disruption. It will be freezing everywhere. 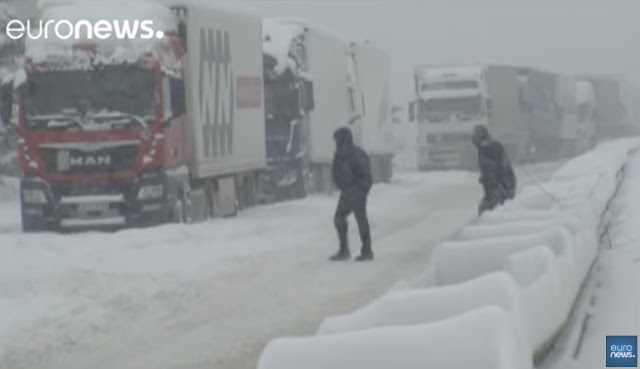 The intense winter weather has been dubbed "The Beast from the East" by British tabloids, citing the Siberian Arctic as the source of the frigid temperatures. The storm system has moved progressively south and west and is expected to bring continued cold and snow for several days over much of Europe. Scientists say the big chill in Europe is partly caused by the fact that strong winds which normally keep cold air 'locked' over the Arctic have weakened, releasing icy blasts across the northern hemisphere. Similar sudden drops in temperature have occurred over North America in recent years and climate researchers say they could become more frequent as global warming further saps strength from the air currents around the pole. Even as Europe shivers, temperatures in the Arctic itself have been unusually warm in recent weeks, the World Meteorological Organization said. The Cape Morris Jesup station on Greenland's northern tip recorded temperatures above freezing several times since mid-February. Its been very easy on us in the NE uk. Looking forward to some proper snow. Building a sled. "Hellish polar vortex"? So it isn't a lake of fire? Damn!!! There is no hell like an old hell. Another headline to deceive humanity...this is geoengineering, not 'weather' and nothing natural about it. The most populated places like the US and the UK are sprayed with ice nucleating chemicals while the remaining 95% of the globe continues to heat, over 300 months in a row. Do some research and stop continuing the elitist narratives before it's too late.. Please stop pushing the elitist narratives and research geoengineering. Advertising geoengineering watch is but one example where you can find accurate information regarding the imploding bioshpere. Dont be jealous, be informed. accurate information is in the eyes of the beholder.